West End Dumplings: "Put your trash into Orbit"
"Put your trash into Orbit"
In 1965, the Manitoba Highways Department introduced "Apollo-age roadside receptacles" called Orbit as part of its battle against roadside litter. They were launched without publicity, opting instead for the orbs to catch on by themselves. The 1.3-metre diameter fibreglass orbs were designed in-house by provincial traffic sign technician Peter Boychuk and were manufactured in Winnipeg at a cost of $150 each. Leading up to each station were also a series of blue countdown signs reminding motorists to "Put your trash into Orbit. 5 minutes .... 4 minutes ... 3 minutes etc." Along with the receptacle, motorists found a supply of empty 'launch bags' into which motorists could insert their 'payload'. Motorists and tourists alike took to the bins and the highways did become cleaner places. By the end of the 1960s there were 126 Orbits around Manitoba. 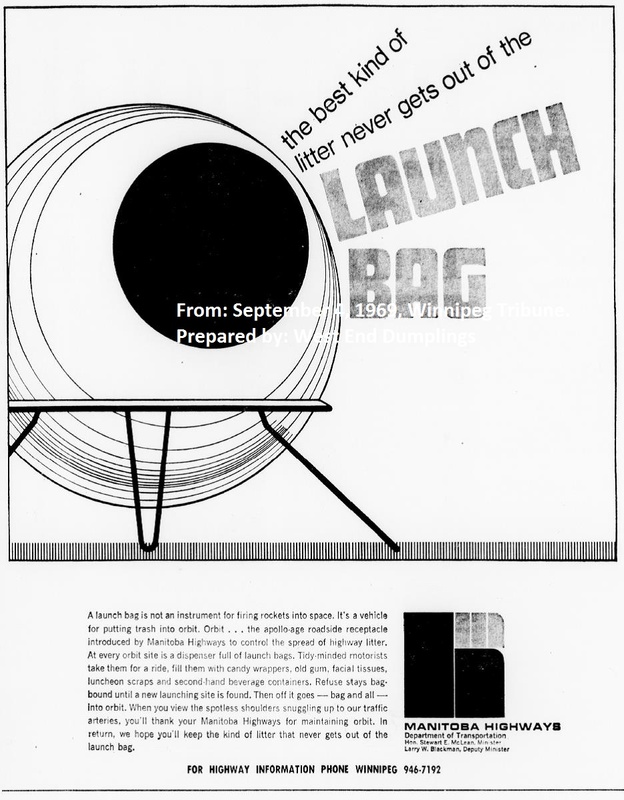 In 1976, The City of Winnipeg chose a 75 centimetre version of the sphere as their new downtown garbage bins, replacing their aging "Don't be a Litterbug" metal containers (above). Instead of Orbit's white, the city chose a dark yellow colour. Boychuk referred to them as Little Orbit Annies. The wide opening of the receptacles, which a Free Press reporter noted in 1969 was “...even large enough to deposit an empty case of beer bottles", attracted unwanted garbage. Loads of commercial and household waste, such as rolled up mattresses, and even pumped sewage and roadkill were sometimes found stuffed into them. In December 1968, a highways worker in the Falcon Lake area found two hitchhikers had taken refuge inside one of them to keep warm. RCMP had to be called when the men refused to leave. Peter Burtniak, Manitoba's Highways Minister complained in 1974 that the Orbits had turned his department into a "garbage collection agency." Over the years, improper use, vandalism and theft took their toll on the Orbits. By the mid-1990s the orbs cost about $900 to replace and there were less than 50 of them left on Manitoba's highways. You can still see Peter Boychuk's design work on roadways throughout Manitoba as during his career he created a number of roadside icons. The field stone Manitoba / Saskatchewan border marker on the Trans Canada highway was his design, (though the sign portion has been replaced.) He also created the "Flagman Ahead" and "Surveyor" highway signs that have since been adopted as the international standard. In the 1990s, he and his wife invented PeterPan wooden cake pans and sell them at the St. Norbert Farmers Market. Where oh where do you find inspiration?? 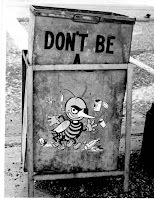 ;) Great post - thanks for the info - should have stolen one when I had the chance!! They would be a great retro item to have ! Composter or heck, upholster the inside and make a great chair ! Good stuff! I had no idea that Orbit lasted until the mid-90s. They had more or less disappeared from the highways I travelled on as a kid by around 1990 or so. The ones I remember seeing looked pretty forlorn, often with garbage stacked all around them. Obviously people were leaving far more than just the fast-food wrappers and other small items they were intended for. I suppose that there was no small need for these things back in the 1960s and 70s...it was before my time, but I understand that pitching things out the window was quite common back then! I remember there used to be an Orbit along the Trans-Canada just west of Carberry (I think it was actually one of the last ones they took out) and I was always somewhat skeptical to throw garbage in it because my dad used to tell me someone was probably sleeping in there! I possess the original pencil drawing of the Orbit that Pete drew for the design. I plan to donate it to the Manitoba Archives when I retire in 2 years. I would love to know if anyone know's where one of these Orbits might still be. I heard that one of the go-kart speedways here in Wpg has one. I would very much like to buy one..if any even exist to buy ?? I miss the Orbits. And that copper and fieldstone border marker. Both the trash receptacles and the border marker that replaced those were quite sterile and boring. My dad worked with Manitoba Highways until 1978. I still have two full boxes of the yellow Orbit plastic auto garbage bags they used to distribute. I mention your blog in a post in the comments as well ..! This is a post with a link to YouTube short story on Peter Boychuk and his creation of The Orbit Trash Receptacle very well Done I also Mentioned your Blog on the comments thank you ! That's great ! Let's bring back the Orbit ! Is your uncle still alive ? He is on the CBC morning radio show this morning. Peter Boychuk is still alive. Peter Pan Wooden Cake Pans can be found upstairs at The Forks. Thanks, Gingy. I will have to check them out ! My childhood memory of the upcoming Orbit signs is a bit fuzzy, and perhaps someone here can clear that fuzz away. There were short-ranged "countdown" signs, where, traveling at 50-55 mph, a 10-second countdown would put you at the Orbit by "blastoff". But how many "minutes to" signs were there, and were there any signs between 60 and 10 seconds (30 seconds)? 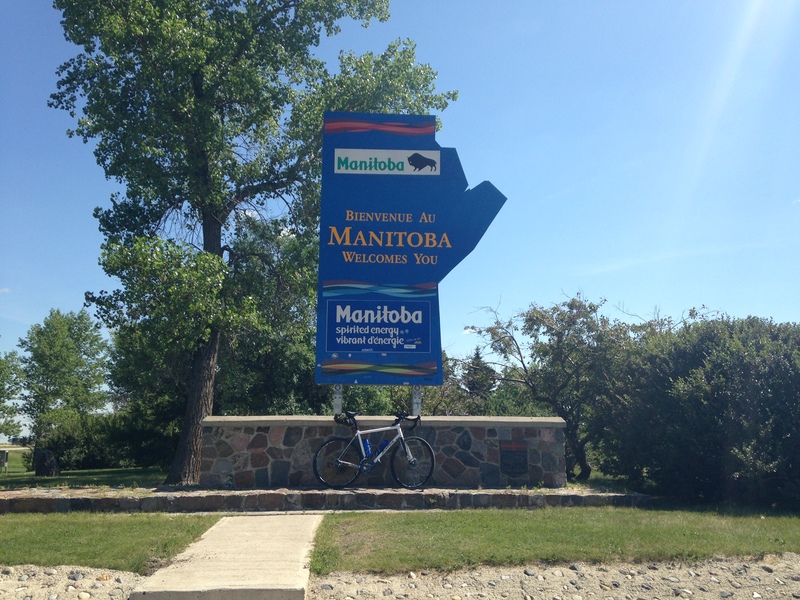 Traveling to Manitoba from Alberta with my family, those signs and the Orbits signaled that we were very near our destination (usually Minnedosa), and we loved to perform the 10-to-liftoff "countdown" with enthusiasm. I wonder how many children across Canada, or Manitoba, or even in one small Manitoba town, with mobile electronic entertainments, would find counting down to a round roadside trash can even the slightest bit interesting or compelling. Probably less than one hand's single digit.